For more than 50 years, veterinarians around the world have relied on The Merck Veterinary Manual for comprehensive, up-to-date information on animal health. 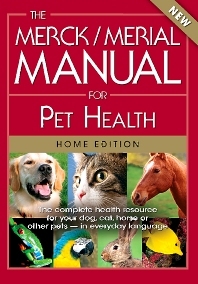 Now, pet owners also have a resource for reliable, in-depth animal health information: The Merck/Merial Manual for Pet Health — Home Edition. Authored by over 200 veterinary experts, this new reference covers the full spectrum of today’s pets, from dogs, cats and horses to birds, reptiles, fish and other exotic pets. With a focus on preventive care, The Merck/Merial Manual for Pet Health can help pet owners partner more effectively with you to keep their pets feeling their best.